No matter how large or small your home renovation dream, a successful home renovation project starts with a well thought out and documented plan. Initial home renovation planning can simply consist of a few sketches and a list of features you want in the home renovation project. In many cases these plans can communicate enough information to enable an architect to develop a set of drawings that contractors can bid and build to. For small home remodeling projects a set of hand drawings may actually be all that is necessary to pull permits and begin construction. However, the more thorough your home renovation planning the more accurate your projects costs, and the more likely you will realize your home remodeling dream. Besides communicating the scope and features of a home remodeling project, home renovation planning also enables you to develop an accurate time line of construction and a project completion date. This is an extremely important aspect of the home renovation project as the timeline helps you to schedule the various subcontractors as they are needed on the site. A home renovation project without a well thought out schedule is a recipe for disaster, both in terms of project costs and delays. A poorly planned home renovation project could also lead to the loss of subcontractors that you slated for the job. Subcontractors have their own schedules to maintain, and if you blow your home remodeling schedule they may have to disengage from the project to meet their other commitments. Upfront solid home renovation planning also enables you to estimate and tract material and construction costs. Home remodeling cost overruns are highly likely when the project is ill conceived and not properly planned. In addition, determining an accurate estimate of home renovation costs prior to construction will enable you to assess the full cost of the project. With this information you can adjust your financing plans, or project size and scope accordingly. By going through this mental process you can determine the items that need to be scheduled and budgeted for, as well as the subcontractors that need to be hired. It is also extremely important to be detail orientated when developing your home remodeling plans. Do not leave TBD budgetary allowances for lighting, flooring, cabinetry, etc., and do not accept contractor allowances from contractors on these types of items. Visit your local home improvement store and cost out the items before signing a contract with a building contractor or breaking ground. By obtaining these specific costs during the home renovation planning process you will obtain a more accurate cost model for your home construction project, and not be disappointed when you find out that lead times are longer than you “hoped for” on these particular types of items. Longer material lead times end up delaying project schedules or having to find alternative product choices that you may have to compromise on. So if you are in the early stages of considering a home remodeling project, make sure you allocate sufficient upfront time for proper home renovation planning. By doing so, you will have a higher probability of achieving your home renovation dreams. 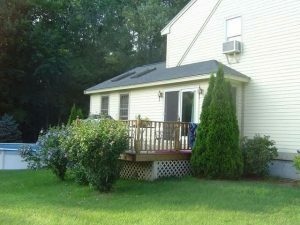 For more help on building a home addition, see HomeAdditionPlus.com’s Room Addition Bid Sheet. 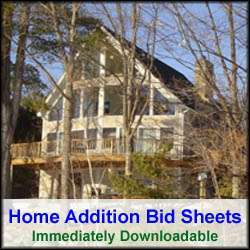 The Room Addition Bid Sheet provides you with the knowledge on how to plan a house addition project, and what to look for when hiring contractors for your new home construction. It also includes a detailed cost breakdown table and spreadsheet for estimating your own new home addition building costs.